The continuing mass agitation in the Muslim-majority Indian state of Jammu and Kashmir, which has so far resulted in 41 deaths and injuries to 3,100 persons in the past nine days, cannot be smugly dismissed as a routine law and order problem – just another episode in the state’s long history of agitations for “Azadi” or freedom from Indian rule which can be quelled with a massive use of force. It is time the government of India discarded its time worn practice of viewing these uprisings as the handiwork of Pakistan-inspired “misguided youth” and completely changed its approach to the question. More importantly, New Delhi has to work out a political solution to what has essentially been a political problem for the past 63 years. The Kashmir valley, which is the epicenter of the mass uprising, has been under curfew for the past nine days with citizens being deprived of food and medicine. The media have been gagged, and cellular phone services have been snapped. 120 demonstrators have been injured in the eye because of the new “pellet guns” the Security Forces use. Not surprisingly, Pakistan took up the issue at the UN. But its intervention has only helped turn the Kashmir agitation into an India-Pakistan conflict. Turning the Kashmir issue into an India-Pakistan conflict helps New Delhi throw a smokescreen over the real reasons for the Kashmiris’ alienation from India; enable repressive actions; and sell these to the Indian electorate as being necessary to thwart foreign intervention. According to Arab News OIC’s Independent Permanent Human Rights Commission said that the use of excessive force against innocent civilians, protesting peacefully over extrajudicial killings, is deplorable and a blatant violation of the right to life, right to freedom of expression and opinion, right to peaceful protest and assembly and other fundamental human rights. This is an aspect of internationalization with far reaching consequences for India. In India as a whole, opinion is divided between those who want strong action to curb “militancy and separatism” and those who want the Kashmir issue to be viewed as a “political one” which has to be addressed politically. An overwhelming majority of Indians are for intensifying the repressive approach, because of the entrenched feeling that unrest in Kashmir is not indigenous but fomented by Pakistan. A minority, however, views Kashmir from a political and moral angle, and wants repression replaced by dialogue, accommodation and an outlook based on an honest audit of the governments’ doings since Kashmir acceded to India in 1947. There is little or no appreciation in India of the circumstances in which the current agitation became what it is – an expression of spontaneous and widespread moral outrage against the extra-judicial killing of a 22 year old Hizbul Mujahideen militant, Burhan Wani, on July 8. Burhan became a militant in 2010 when he was just 16 after seeing his brother Khalid being seized and beaten to death by the Security Forces even though Khalid was no militant. In 2010 Khalid was not the only Kashmiri to be killed. The Security Forces had run amuck, killing 112 people in an effort to put down civil unrest which manifested itself basically in stone throwing at the police or paramilitary forces. As Kavita Krishnan, Politburo member of the Communist Party (Marxist-Leninist-Liberation), points out in the Guest Column of www.kafila.org Burhan himself was killed in violation of the law as laid by the Indian Supreme Court. Ironically ,on the day Burhan was killed “in an encounter”, the Supreme Court had said that every “encounter death” (a police euphemism for extra-judicial killing) is to be deemed an “extra judicial killing”, investigated and brought before a court whether the person killed was a terrorist or not. The Supreme Court had listed 1528 cases of “encounter deaths” for investigation. In Kavita Krishnan’ view, the killing of Burhan was extra-judicial and therefore illegal. 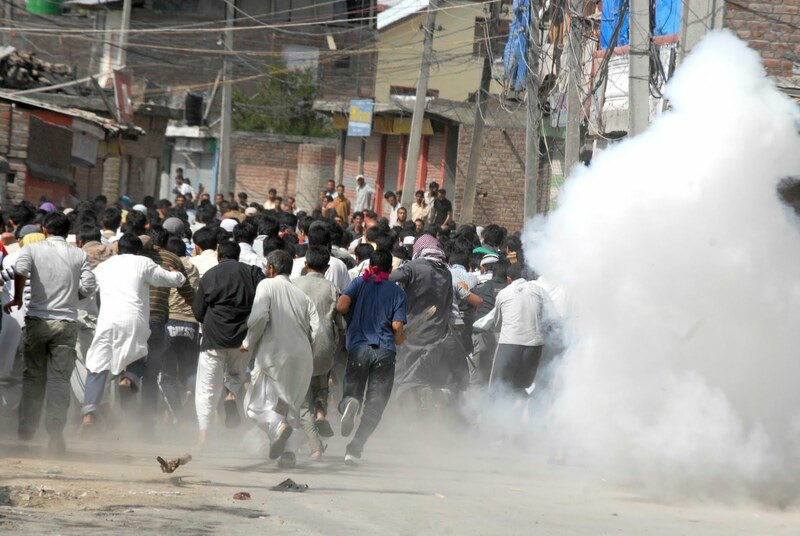 Gautam Navlakha, Consultant Editor of the respected Economic and Political Weekly in his piece inkafila.org said that the July 2016 unrest resembles the unrest in 1986-90 which transformed peaceful Kashmir into a “military garrison” of 600,000 men in uniform. He blamed the obduracy of the government for these agitations. “What saddens me most is that the Indian intelligentsia, with honorable exceptions, have been mired in dogma and a nationalist ideology ,communal or secular, both unequivocally wedded to the nation state and its inviolability. They have blinded themselves to the Indian State’s primary responsibility in bringing things to this pass,” Navlakha wrote. Pointing an accusing finger at the Hindutva forces, which enjoy government and military patronage in Jammu and Kashmir (J and K) state, Navlakha said that 29,000 Village Committee members have been armed and trained by the Hindutva organizations Bajrang Dal and the Shiva Sena. However, the militarization of the Kashmir Valley could not prevent 20,000 people from attending Burhan Wani’s funeral on July 9 where the Hizbul Mujahideen was brazen enough to give the dead militant a 21-gun salute. That the thirst for “Azadi” (freedom) is deep-seated and has nothing to do with participation in Indian elections will be evident if one reads former RAW chief A.S.Dulat’s book: Kashmir: The Vajpayee Years. The roots of Kashmiris’ alienation from India lie in broken promises by the Indian state, mainly relating to the steady erosion of the state’s autonomy guaranteed in the Instrument of Accession (IOA) and Art. 370 of the Indian constitution. Since J and K was a Muslim-majority state which opted to join the Hindu-majority Indian Union after the British left in August 1947, the Nehru-led Indian government made certain commitments to the Princely state through the IOA and subsequently through Art 370 of the Indian constitution. The IOA and Art 370 made accession to India acceptable also to the then popular Kashmiri leader Sheik Abdullah. After accession, Abdullah became “Prime Minister” of what was, on paper at least, a semi-independent Kashmir. Since Muslim majority Pakistan disputed J and K’s accession to Hindu-majority India and sent in its forces to thwart the accession, the United Nations entered the arena at India’ invitation. Subsequently, India promised to the UN and the Kashmiris, that it will hold a plebiscite or referendum once the Pakistani forces leave J and K. Since the referendum is still to be held, Pakistan has been periodically demanding that the UN force India to hold a referendum. And whenever Kashmiris clash with the government in New Delhi and its henchmen in J and K, they too would demand a plebiscite to determine the state’s future. As per the Instrument of Accession (IOA) signed by Maharajah Hari Singh of Kashmir and the then Governor General of India, Lord Louis Mountbatten on October 26 and 27, 1947 respectively, J and K state was to hand over powers to India only in respect of three subjects – Defense, External Affairs and Communications (roads, railways, airports and telecom). The IOA specifically stated that J and K was not committed to accepting any future constitution of India. Art 8 of the IOA also guaranteed the sovereignty of the State. J and K was to have its own constitution and accordingly, a Constituent Assembly was established on October 31, 1951. The Indian Constitution, adopted in 1950, included Art 370 which guaranteed J and K’s autonomy. In 1952, the Constituent Assembly of J and K, accepted Art 370 with the provision that any future changes in it should have the sanction of the J and K Assembly. However, according to renowned Mumbai-based human rights lawyer, A.G.Noorani, given the de-facto power equation between New Delhi and J and K, Art 370 started getting eroded fairly quickly. On August 8, 1953, Sheikh Abdullah, the “Prime minister” of J and K who had been instrumental in the state’s accession to India rather than Pakistan, was dismissed by the Nehru government and replaced by Bakshi Gulam Mohammad, a lackey of New Delhi. On February 6, 1954, the J and K Constituent Assembly ratified the state’s accession to India. Four years later, the jurisdiction of India’s Comptroller and Auditor General was extended to the state. In the same year, the state’s administration was integrated with the all-India services. In 1959, the jurisdictions of the Indian Supreme Court and the Election Commissions were also extended. On December 21, 1964, the obnoxious Art 356 of the Indian Constitution, which enables the Central Government to sack governments in the states, was extended to J and K. This was used to sack governments in that state. The Governor, appointed by the Central government, could make major changes in the powers of the state. Governor Jagmohan consented to the extension of Art 249 of the Indian constitution to J and K, thus enabling the Central government to legislate on a subject in the States List in the Indian constitution. Between 1954 and 1994, 260 of the 395 Articles in the Indian Constitution had been extended to J and K. Besides that, 94 of the 97 entries in the Union (Central) List of subjects were extended to the state. From the Concurrent List of 47 subjects, 26 were extended to J and K. Of the 12 Schedules, seven were made applicable. While the J and K Assembly has passed resolutions seeking the restoration of Art 370 in its original form, on the plea that it will stem the Kashmiris’ alienation form India, governments in New Delhi and political parties in the rest of India have been wanting the total abolition of the Article so that J and K becomes indistinguishable from other Indian states. But successive governments in New Delhi have resisted the temptation to repeal Art.370. To satisfy the pro-abolitionists, they would say that Art 370 has been crippled so much that it is only a form without any substance. Interestingly even those Kashmiri parties and politicians who periodically demand restoration of Art 370 had allowed its dilution while they were in power in the state only to curry favor with power centers in New Delhi. The Kashmiri politicians’ insincerity and their slavishness towards New Delhi have been among the main causes of Kashmiri alienation from India and the political structures it had set up in J and K. The malleability of the Kashmir politician is cynically used by New Delhi to get its way J and K.
To contain the on-going agitation in the Kashmir valley, the Narendra Modi government is trying to make the armed forces less visible in the streets. Orders have been used to use the local police while conducting raids against militants. But through such measures, New Delhi will only be scratching the surface of the Kashmir problem. What is needed is a total change in the style and substance of engagement with the Kashmiris. Besides attitudinal change, the issue of restoring the autonomy to the state as per the spirit of Art 370 will have to be discussed with all the stakeholders with the aim of arriving at a workable consensus. Indian parliamentary elections from April 11 to May 19. Counting begins on May 23.